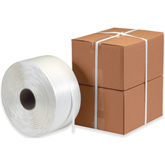 .41" x 8000' 16x6 Poly Strapping provides superior performance for light to medium-duty bundling and carton closure applications. Signode comparable Contrax Polypropylene Strapping has excellent elongation recovery properties, making it ideal for products that shrink or compress. Signode Poly Strapping has been designed to handle the break strength of 500 lbs Nominal Break Strength.